Puerto Vallarta, Mexico - According to CNN, this summer is a great time to discover the world's most beautiful piers. In an editorial feature published on July 28, Tamara Hinson listed the world's nine most spectacular piers. Whether you want to travel as far as South Africa, Denmark or Italy, or would rather stay closer to home, there are plenty of spectacular piers that'll make your trip worthwhile. Among them are the UK's Ryde Pier, which just celebrated its 200th birthday, and New York's historic Pier A that will reopen shortly after decades of neglect and a multi-million dollar revamp. The structure, first opened in 1886 and now listed on the National Register of Historic Places, closed to the public in 1960 but will soon host a visitor center, an oyster bar and a fine dining restaurant. Another one of these "icons of jetty-hood" is the new Los Muertos Pier in Puerto Vallarta, Mexico. A celebration of sleek design and style, city renewal and transportation convenience, this 328-meter-long pier was re-designed by architect José de Jesús Torres Vega in 2013 as part of the city's urban renewal plan. The first Los Muertos Pier was constructed in the early 1960s and served as a launch point for the cast and crew of The Night of the Iguana, which was instrumental in making Puerto Vallarta one of the world's most sought-after Mexican beach vacation destinations. Almost 30 years later, a humble concrete pier was built in it's place, which served its purpose but was not much to look at, so the decision to build a new one was made in 2010. After a wait of nearly three years and an investment of $2.4 million USD, the new Los Muertos Pier was officially reopened by Jalisco Governor Emilio Gonzalez and Puerto Vallarta Mayor Ramon Guerrero on Friday, January 4, 2013. 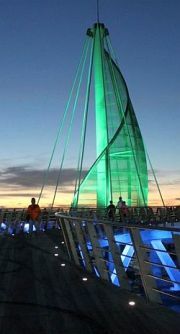 Boasting a 65 meter walkway, with ample railings and lighting for safety, that leads to a roundabout with a "sail" at its center, the new Los Muertos Pier features multi-colored lights that illuminate the sail and shine out over the water, adding to the pier's ambiance during the evening hours. "This icon of the city is a reflection of the modern and diverse commodities found in Puerto Vallarta. It is a sign of the thirst the city has for endeavors that will modernize Puerto Vallarta and make it the best city to visit on the Pacific Coast," Mayor Guerrero Martinez said at the inaugural celebration. Considered one of the Southside's most iconic landmarks, Los Muertos Pier is more than a tourist attraction - it is another jewel in the crown of Puerto Vallarta's transformation. For a complete list of the World's 9 Most Beautiful Piers, visit CNN Travel.